About 30 to 60 minutes before sunrise on April 11, look for the waning crescent moon to shine above the dazzling planet Jupiter, with Jupiter barely above the eastern horizon. Binoculars help you to spot these two worlds. 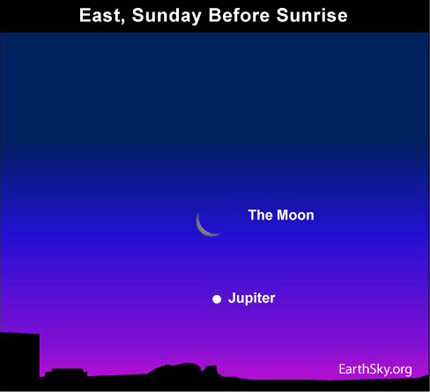 Although the moon and Jupiter appear close together at Sunday dawn, they are not really near each other in space. These worlds simply reside on nearly the same line of sight now. The moon, our closest celestial neighbor, lies about a quarter million miles away. Jupiter – the 5th planet in orbit outward from the sun – lurks way beyond the moon at more than 2,000 times the moon’s distance. Jupiter is the largest and most massive planet in the solar system. If Jupiter stood at the moon’s distance from Earth, this great big world would appear some 1,600 times larger than the moon in our sky. However, if we placed the moon at Jupiter’s distance from Earth, our moon would appear to be about the same size as Jupiter’s 3rd and 4th largest moons, Io and Europa. By the way, Jupiter has 63 known moons of its own. Need a sky almanac? EarthSky recommends . . .